APOPO is an NGO focused on finding and removing old land mines with an unlikey ally: the Gambian Pouch Rat or HeroRats. Somewhere the spirit and fire of Diana, Princess of Wales is absolutely glowing, as her work to remove forgotten land mines is being ingeniously realized. On this, the 20th anniversary of the Ottawa Treaty banning anti-personnel mines, there is an incredible and highly innovative organization that is making that convention a reality. 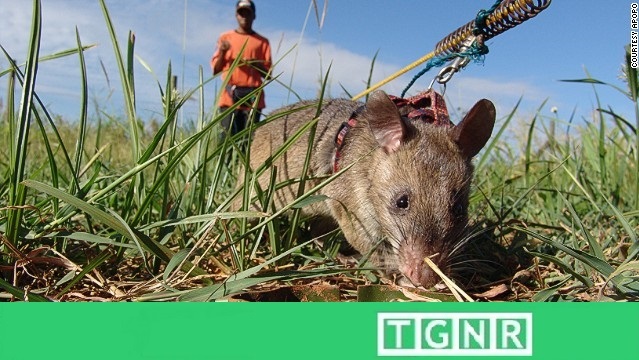 A Belgian NGO called APOPO is securing acres of land from mines and other un-exploded ordinances (UXOs) using specifically trained “HeroRats”. Not only have these HeroRats been immensely effective in their mission, their casualty rate is zero. Despite the initial reaction of most people when rats become the subject of discussion, rats are in fact ideal candidates for the task of mine removal if you ask Bart Weetjens, founder of APOPO. Weetjens’ HeroRats – specifically the indigenous giant Gambia pouched rat- are intelligent and surprisingly social creatures with a remarkably keen sense of smell. Their discerning pink noses are what lead the HeroRat to its bounty: mines. A HeroRat on the scent. On their Tanzania training campus, candidate HeroRats receive positive reinforcement training called “clicker”. By graduation, HeroRats can hear a click from their handler, know to sniff for TNT in a mine, and, after notifying their shielded handler to the presence of a mine, receives a treat reward. Bananas and peanuts are their treats of choice. Most importantly, all HeroRats in the field are too light to trigger any active mines. It’s a simple arrangement that has generated overwhelming results. As of June 2015, APOPO is using their HeroRats for mine removal efforts in Angola, Cambodia, and Tanzania. The magnificent success of HeroRats in land mine removal has inspired APOPO to branch out into disease detection and prevention. Specifically HeroRats are highly effective, using their amazing noses, in analyzing laboratory samples for Tuberculosis (TB). In a laboratory setting, a professional with a microscope can only effectively examine 25 samples of sputum a day. Conversly, trained HeroRats manage to screen over 100 samples of sputum in a single hour. Moreover, HeroRats can detect TB presence in a sample with fewer bacteria than traditional methods. This is crucial in regions where comorbidity of TB and HIV/AIDS are high as individuals with HIV/AIDS can be TB positive but present with fewer bacteria in a sample. Whether it be clearing former battlefields of un denoted ordinance, or on the trail of disease prevention, HeroRats are a unique partner. For their immense contribution, HeroRats are well treated. During their working “careers” HeroRats work only a handful of hours each day and are retired after six years of service. Once they reach retirement, HeroRats continue to have daily check-ups, interaction with their handlers, and plenty of time to play and socialize with other retirees. Though the work of APOPO and their HeroRats are far from complete, the results so far have been undeniable. For many the scourge of tuberculosis or UXO’s is a world away, yet they are all too local for many on Earth. North Africa and Eastern Europe are still removing mines from the Second World War, originally placed some seven decades prior. APOPO’s mission is that rare combination of benevolent purpose and human ingenuity, partnered with animal intelligence. All in the pursuit of solving a terrible dilemma with deadly consequences. *Publisher’s Note: This article was originally published on July 5th, 2015. It was written with contributions by Paul K. DiCostanzo, TGNR Managing Editor.